In early June, Eremurus (er-e-MEW-rus), perhaps the most spectacular bulbous plant of them all, takes its rightful place, center stage, in the English Walled Garden. 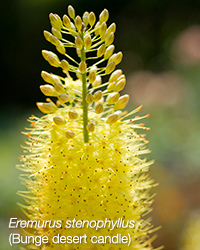 Eremurus, commonly known as foxtail lily or desert candle, is a member of the lily family. Not a true bulb but a tuberous root, it stores its food in fleshy, starfish-shaped roots, not in stem or leaf tissue as with true bulbs. In early spring, straplike leaves emerge and form a rosette at the base of the plant. The impressive flower stalks can reach to 9 feet (E. elwesii and E. robustus) with hundreds of dense ¾- to 1-inch white, pink, yellow, orange, or brown bell-like flowers that cover the top half of the tapering spike but bloom from the bottom up. The long-lasting flowers, which should be protected from strong winds, are showiest when planted against dark backgrounds such as evergreens. Plant Eremurus tubers in September in full sun and rich, well-draining soil. Supplement the soil with rotted compost or manure. To plant, open a 15-inch wide hole 6 inches deep in the prepared site. Pull up a shallow cone of soil in the middle. To improve drainage, add an inch or two of coarse sand before spreading the roots out over the cone. Cover with 4 to 6 inches of soil. Because Eremurus resents being disturbed, do not divide or transplant it unless absolutely necessary. Although hardy to Zone 5, Eremurus needs a heavy winter mulch of well-rotted manure, compost, or straw. Add a heap of evergreen branches over each crown. Remove the mulch in early spring as growth resumes, leaving it beside the plants until all danger of frost has passed, so the tender shoots can be covered on cold nights. Of the 40 species of Eremurus, four are commercially available: E. himalaicus grows to 4 feet with dense, pure white racemes and 18-inch straplike leaves; E. robustus is enormous, with 8- to 10-foot pink or white flower spikes and 4-foot leaves; E. stenophyllus is a dwarf species with 24- to 36-inch primrose yellow flowers and l-foot leaves; and E. x isabellinus is a hybrid of E. olgae and E. stenophyllus and includes the Ruiter and Shelford hybrids that are popular with Chicago gardeners. When well-sited with good soil preparation, and with some loving care on frosty spring nights, Eremurus can be a long-lived showstopper in any garden.